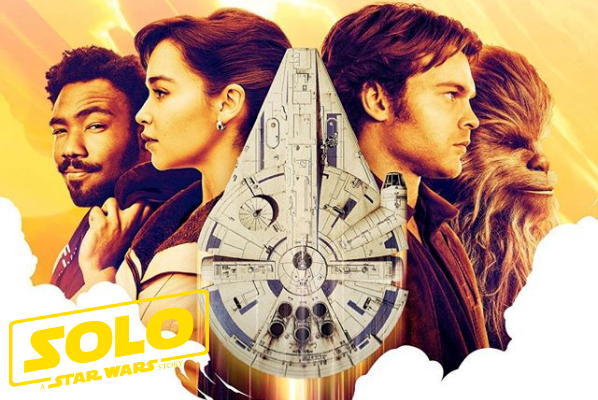 Some are accusing Disney’s latest Star Wars movie, Solo: A Star Wars Story, of leaning on previously established aesthetics and characters which are all but irrelevant because the outcomes have already been depicted. That it somehow makes the presentation less effective because we already know the consequences of their actions and choices. Perhaps, but since they’ve been making the same seven movies for over 100 years don’t you think that’s kind of an obtuse statement? Was Lawrence of Arabia any less effective because you knew T.E. Lawrence’s life story? No. And before anyone gets too excited, I’m not comparing the quality of these two films, simply the extrapolative nature of the films lead characters. And yes, I would like very much to see Lucasfilm explore different eras other than those surrounding the trilogies, but there’s plenty of time for those stories and that also doesn’t make Solo any less effective of a prequel. Some are suggesting that this is the reason for Solo’s underperformance at the box office but, while I don’t entirely agree, it’s well covered territory so we won’t comment on that here. Categorizing films into dozens of sub-genres doesn’t change the fact that since the late 1800’s when celluloid was first used for motion photography; there have been seven types of plots used in filmmaking. Overcoming the Monster, Rags to Riches, The Quest, Voyage and Return, Comedy, Tragedy and Rebirth have been a part of every movie you’ve seen since you first sat in a theater or at home. So why then is “prequel” a dirty word all of a sudden? And why is Star Wars in particular getting picked on? Well, people at the top always do because they are an easy target so fine, let’s look at Star Wars. Backstory is the life and blood of any franchise that is lucky to be around and successful long enough, and when you’re talking about longevity and success, Star Wars has done very well for itself. Instead of simply cashing on brand recognition, Star Wars gives the fans what they want while managing a steady flow of new content at the same time. That’s the sweet spot they’ve built for themselves. By becoming multi-generational they get to use both sides of their brains and tell original stories while at the same time dive back into their deep well of history. The idea that it’s not considered story if its backstory is just flat out wrong and needs to die. Chronological storytelling of course is the main driver when it comes to franchise shtick these days (MCU) and Star Wars is all over that with the current trilogy which will come to end December of 2019. But what are they doing after that? You guessed it, more new content! So, if they want to go back in their timeline once in a while and pay homage to the untold adventures of their classic and soon to be classic characters, so be it! Star Wars isn’t like most other franchises. It’s vast beyond words and Lucasfilm employs a story group whose sole purpose is to keep it all organized. When you’ve got 11 films and counting, countless books and comics and graphic novels and hundreds of TV episodes all depicting what life is like for billions of inhabitants on roughly 460 known planets, things can get messy. And those are just the explored regions of this space, that doesn’t include the Unknown Regions and Wild Space which could also and likely will, contain countless planets and citizens. More than any other franchise, Star Wars has limitless possibilities when it comes to storytelling ideas and when you have that at your fingertips, the banal and the bland becomes fresh and exciting. Literally at every turn is a new path waiting to be explored, through every door is a new adventure and every window on a star freighter is a prevue into another life. This is how Star Wars employs traditional story telling methods to tell non-traditional stories. By having that wellspring of ideas at the fingertips of their creative team, they can make an ordinary Han Solo film, extraordinary. While I personally find the film a little emotionally inert, I can’t deny it’s full of enough Star Wars references and homage to hold my attention and make it fun. I wasn’t entirely sure I enjoyed everything I saw, but I never took my eyes off the screen, not for one second. And yes, history if full of examples of franchises trying and failing but Star Wars is not one of them, not yet anyways. Including Solo: A Star Wars Story they will have made five prequel films, all of which have been successful financially and somewhat critically. Yes, we know how critics and fans felt about Episodes I, II and III but it isn’t because of content, it was because of execution. Rogue One: A Star Wars Story being the other standalone film to date was hugely successful from all points of view and that’s because they gave fans a taste of the familiar and a taste of the avant-garde. And that’s what Solo: A Star Wars Story has done, not to the success of previous entries mind you, but it is every bit the Star Wars movie Rogue One is. In the end it just boils down to taste. And the majority of people who have bothered to see Solo, love it. And even if the predetermined aspect of the stories bothers you, Star Wars always finds a way to open another door. At every turn in Solo there’s an EU reference or a subtle nod to the ever-growing galaxy of canon Star Wars media whether its name dropping Bossk or the AV-21 Landspeeder, the fighting style of Teras Kasi or surprise appearances by classic characters such as Maul and Edrio. And did you catch the VCX-100 reference? By employing this style of storytelling they’ve left room for more and that’s what smart studios do, they create options for themselves even amongst perceived failures, and sometimes that includes prequels. This led to the success of Rogue One in 2016 which was entirely in context and involved high-stakes events even the most casual Star Wars fan would know. But they threw in enough minutiae from the larger Star Wars universe that it made the film an extremely enjoyable one despite the predictive nature of the film. Star Wars is different because it started off different. Remember the collective head scratching when the crawl first appeared with the words, “Episode IV”? The fact is they’ve been telling abstract stories with varying degrees of linear and non-linear timelines for 41 years now. It may not be your cup of tea and every entry won’t be a record breaking success but it sure beats the mundane and pointless. So here’s to 41 more years of Star Wars storytelling!